Anyone can create a beautiful home by foraging, and salvaging what they find. Whether a box of rusty nails or a disused armchair missing a leg, discarded objects can be restored, recycled or repurposed to fill the home with personal style. Artful interiors are born from curiosity, creativity and imagination, yet many of us fail to see a potential curtain rail in a bamboo stick or a hidden kitchen worktop in an old carpenter's bench - let alone knowing where to find such objects. 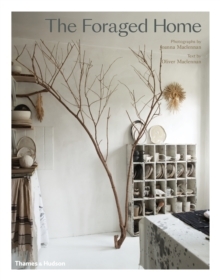 Presenting the techniques and philosophies of a wide spectrum of experienced foraging homeowners, this book showcases unexpected and inspiring interiors from all over the world, from an upturned boat in France to an Australian beach house. Such diverse locations each demand a different approach to foraging and, as a result, each home has a distinct sense of style. In an era when self-sufficiency, living off grid and saving our planet have never been more important or appealing, The Foraged Home will provide guidance and inspiration for all those looking to go beyond the world of mass-produced flat-packs.